The first day of summer in the Northern Hemisphere is just a couple of days away. With it comes long warm days, sunshine, and unfortunately harmful UV rays. In many cultures using an umbrella to shield you from the sun is as much a custom as using one to keep the rain off of your head. Unfortunately most umbrellas don’t offer a solution that is visually fun and exciting. 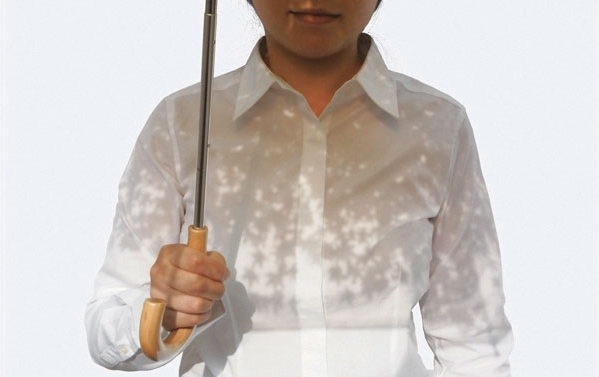 Japanese designers Fumito Kogure and Shinya Kaneko have come up with an artful answer to the umbrella. Komorebi is a Japanese saying that roughly translated means “sunshine filtering through foliage.” These two designers have applied that phrase to your typical umbrella creating something that shades you with the feeling of sitting under a tree. Komorebigasa, can be used in rain or shine but the shadows it creates on a sunny day simply make me smile. If you have 3900 Yen ($41.50) you can pick it up here. Posted in General and tagged Culture, Design, Fumito Kogure, Japan, Japanese Designers, Product Design, Shinya Kaneko, Summer, Umbrella on June 19, 2013 by Author. ← Growler, A City Bike With a Purpose… Beer.